Following last month’s first ascents of Starbuck Peak and Mt Baume, I am delighted to have completed nine tenths of the Shackleton Traverse with the Crean family, at the end of an extraordinary spell of calm weather in the Southern Ocean. It was just a shame that an unfortunate accident stopped us completing the final part. When I first did the Traverse in 2000 Reinhold Messner broke his foot on the Crean Glacier. Last week Aileen Crean O’Brien broke her leg at almost the same place, tripping on her sledge just below the famous impromptu toboggan ride made by her grandfather Tom Crean, with Shackleton and Worsley 100 years ago. Unlike Messner, Aileen was too badly injured even to hobble. 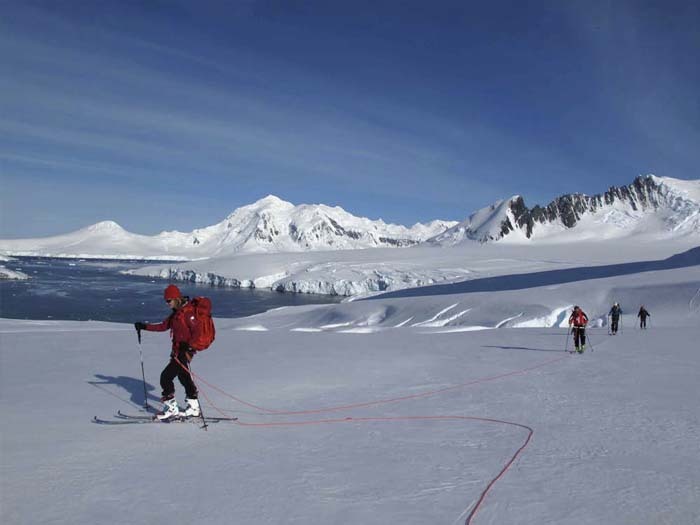 However, she was able to complete most of the Traverse lying down, towed on a sledge by Crag Jones and me, with Cian, Morgan and Bill sharing out her luggage on the 16 km ski journey to the nearest evacuation point at Fortuna Bay. It all went very smoothly, blessed with calm weather and generally good visibility. Once we reached Fortuna, skipper Alec Hazell did a brilliant job of getting Aileen back on board Pelagic, in a fairly testing swell. By lucky chance our return to Grytviken coincided with a visit by HMS Clyde, whose captain agreed kindly to give Aileen a speedy comfortable lift to Stanley hospital, 800 miles away. The rest of us hope to go back round to Fortuna Bay during the next few days and complete the final section to Stromness, before sailing more slowly back to Stanley.